habitat fragmentation and climate change. people spend behind the wheel.The health of children and people of color is disproportionately affected. The impact of transportation on quality of life is perhaps most easily seen in environmental degradation. America’s auto-oriented transportation system dirties the air, contaminates oceans and rivers, consumes open space and wildlife habitat, hastens climate change, and guzzles energy. 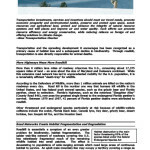 This factsheet examines the effects of transportation on air pollution, water pollution, climate change, and habitats. improved as a system. Intermodal connections must be made seamless for people as well as freight. Better management is the key. Business leaders have the experience and knowledge of such systems to give invaluable input into the decision-making process locally, at the state level, and at the federal level of transportation planning. The transportation system should alleviate poverty and support wealth creation. Poor people and low income communities should have reliable and affordable access to good jobs, education and job training, affordable housing, childcare and other services and opportunities throughout metropolitan areas. Unlike past transportation decisions that have left whole segments of our population behind, modern transportation investments must pull together the communities and opportunities within a region rather than driving them further apart. like street maintenance, transit systems that are well integrated into regional destinations, and other amenities like safe sidewalks and transit-oriented development. streets. Overall mobility will be reduced and the entire transportation system will be less stable. access. The transportation system should support job creation and grant all people access to good jobs. Unlike past transportation decisions that have focused on short-term solutions and have ignored large sections of the population, modern transportation investments must expand opportunities and improve quality of life. households, where it becomes an economic burden, standing in the way of wealth creation and home ownership for many low- and middle-income households.